NOTE: Some updates are at the end of the article. 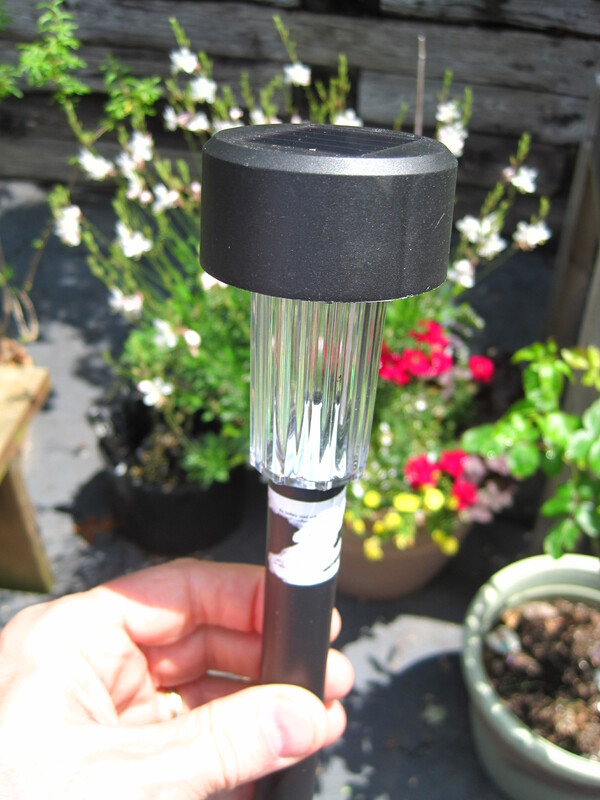 Recently I purchased a couple of Solar powered LED garden path lights at the local Dollar Tree store for $1 each. Ever since I read TalkingElectronics.com‘s writeup on converting such garden lights into 5-volt solar power supplies, I have wanted to tinker with one. The one dollar light intrigued me because it was so amazing that one could be sold for that price. The one-dollar LED garden path light reduced the parts count and that is probably a big part of their ability to sell it so cheaply. I reverse engineered the circuit. It matches, quite closely, the example circuit for the Shiningic YX8018 specification sheet. My reverse engineered schematic is shown below: The Shiningic YX8018 specification sheet does not show the internal schematic of the YX8018 integrated circuit. However, the YX8018 contains an approximately 200 KHz gated oscillator that drives an open drain NMOS switch to ultimately boost the battery’s 1.2 volts to, typically, three volts in order to power a three volt white LED – a sort of a joule thief. A joule thief is a minimalist Armstrong oscillator voltage booster. It would function similarly to the circuits shown by TalkingElectronics.com‘s writeup on the older type of garden lights that use discrete components. The YX8018 only runs the oscillator when it detects that the solar panel is in the dark. When the solar panel is producing power the YX8018 turns off the oscillator and the battery is charged. Analog Devices did a nice article on the YX8018 device. They drew The YX8018 internals based upon their analysis, which is shown below. Below the Analog Devices’s YX8018 illustration is one from Pete’s QBASIC website for the QX5252, another similar, if not identical IC. There are others, as well, that appear to be functionally equivalent if not, in some cases, identical chips. For example, YX8019, JD1803, ANA608, ANA618, YX802, YX803, YX805, YX806, JD228, JD318 and F1-4S597. All manufacturer datasheets refer to the 4-pin package as a TO-94 package, yet the only TO-94 JEDEC package that I can find is for the threaded bolt thyristor. To me, it is a 4-pin SIP package. I have no clue as to why the Chinese refer to this as a TO-94 package. Check out THIS-POST for some interesting information on this chip. 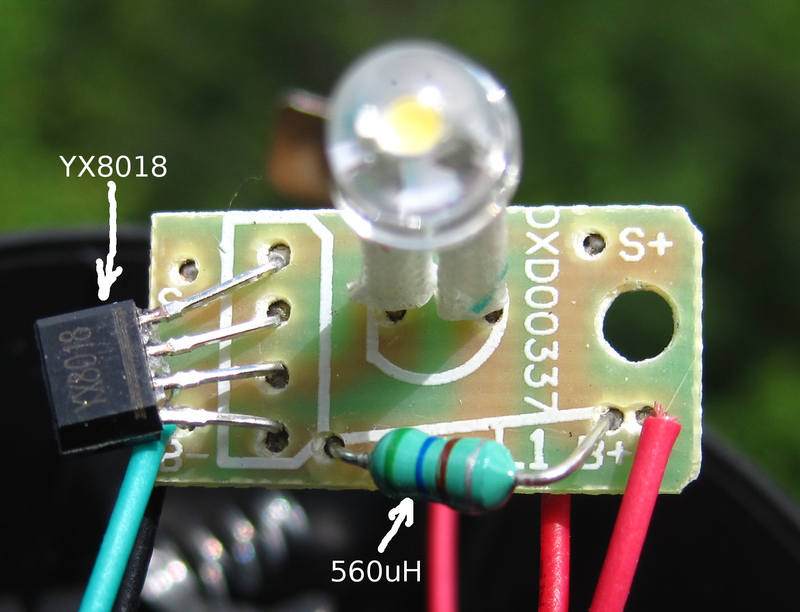 Reader “Peter” posted a good comment and referenced a blog named “Tom’s Projects” wherein he describes his successfully modified a similar garden light to power a thermometer with Morse code output on an LED as well as providing the 3.3V supply for its ATtiny25 controller. I assume that Peter and Tom are actually the same person. In any case, he has successfully achieved my objective, at least at the 3.3V level. His series of three posts are excellent and I encourage you to read them. They are Part1, Part2 and Part3. An anonymous commenter to “Tom’s Projects” references a good Russian article about how to make a YX8018 stabilized power supply. The Google translation version is at THIS-LINK or the original Russian version is HERE. This entry was posted in Electronics, hardware and tagged voltage converter. Bookmark the permalink. I was also involved with LED’s as part of my job at the University of New England. When the first red/green LED appeared there were no drivers for them available, so I made up a circuit to change the current direction and hence the colour on a binary 1/0 input. I tried to patent it but was warned that a search would cost me an arm and a leg, and by the time it was registered all the commercial big boys would have them on the market. This was so, of course. nice approach; i think you do understand that using a 5v1 zenner + 200ohm you limit the output curent to about 25mA. also, if you do the math, 5v1 / 10k = 0.0005A = 0.5mA…, exactly what you got. just bought few of them just to get a 9V dumb charger to my multimeter accu. so i’ll be using just the pv cells. if it comes handy this wkend, i may just try to mod the “coil” and add zenner as you did. hopefully, i’ll update the post w/ results. . Both of my lamps died and the Dollar Tree no longer sells them. If they get more I’ll try your suggestions. Here’s a thought. The YX8018 only runs ‘after dark’ and switches off the LED during the day to charge the battery. You could get four units, remove the 560uH inductors and LEDs and just connect the four batteries in series (with the other circuitry in place, using only the charger part of the YX8018). That should give you 4.8 to 5.0 volts at 600mA hours when fully charged. In theory, about 3 watts of power. If you had tested the piece of PV first, you could save you all the trouble. The PV offers 2.0 v in open circuit and 25 mA max, with direct sunlight, it is reduced to 20 mA with 45 angle of the sun. I can hardly see how you can get 5 v from there. By the way, the LED drains 10 mA, and there is not enough time charge the battery, unless installed in the tropics, on summer time. The current drops to 5 mA when cloud covers the sun. From the IC data sheet inductor 82uh = 15ma, 150uh=10ma, it follows 560uh=4.5ma of battery current. Step up to 3.2v => 4.5/2.5= 1.8ma LED current at 3.2v. At best this would be ~1ma at 5v. No need for the 200ohm going to the zener. No feedback on voltage, Circuit is a Current regulator. If using less than rated current the energy is wasted resulting in poor efficiency. Need a better diode, schottky for example, really will make a difference. 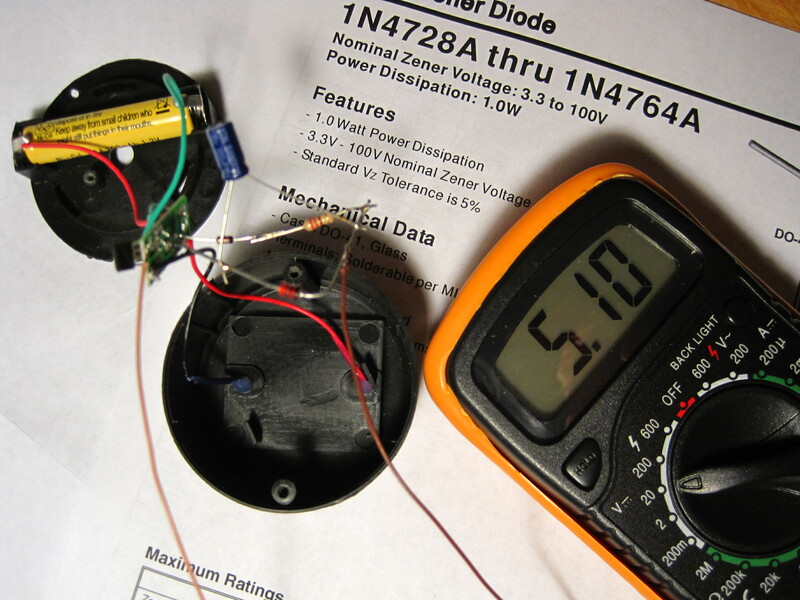 Turn off time of the diode is key to making a switcher work efficiently. Good points – I’ll try if the local store ever stocks the lights again. I found some halloween themed lights that have the same basic circuit for $1 at Dollar General. I’m finessing out the solar cell right now. The current spec in the datasheet is the led pulse current, not the average current. The LED is on approx 45% of the cycle, so the avg. current will be 45% of this. I have done the maths & confirmed it with measurements. The current in the 2.5V table is wrong (actually a bit over 10mAav for 150uH (LED across inductor)). where V1 is Vcc-Vsat. (~.02Vav during ON time), Ti is the FET ‘ON’ time in uS, T2 is FET ‘OFF’ time in uS, V2 is the avg LED vol.- Vcc during pulse, & L is inductor in uH. If I got it right: Iav = (V1T1)sq/2LV2 ,where V2 is Vout + Vdiode – Vcc. Thanks for your comment. In my Garden Light post I have added a reference to your Tom’s circuit blogs morse thermometer project. , where Ttot is cycle period in uS (1/FMhz) Average freq. of the 3 I tested was ~ 220KHz. This is a rough guide at best, as the actual o/p current is highly dependent on battery & load voltages (V1squaired & inversely proportional to V2 (Vload-Vbat)). If the load is a LED connected across the inductor as in the 2.5V cct., V2=Vload so current is more stable. Nice to know someone got it working, at least for 3.3V! He is using a NXP LPC810/24 (similar to LPC11xx that I used to port the NuttX RTOS). This microcontroller could be used with this solar battery project to detect some external of home event and send an alert. Thanks – I like that – a vampire transmitter! How could you take advantage of the driving circuit? 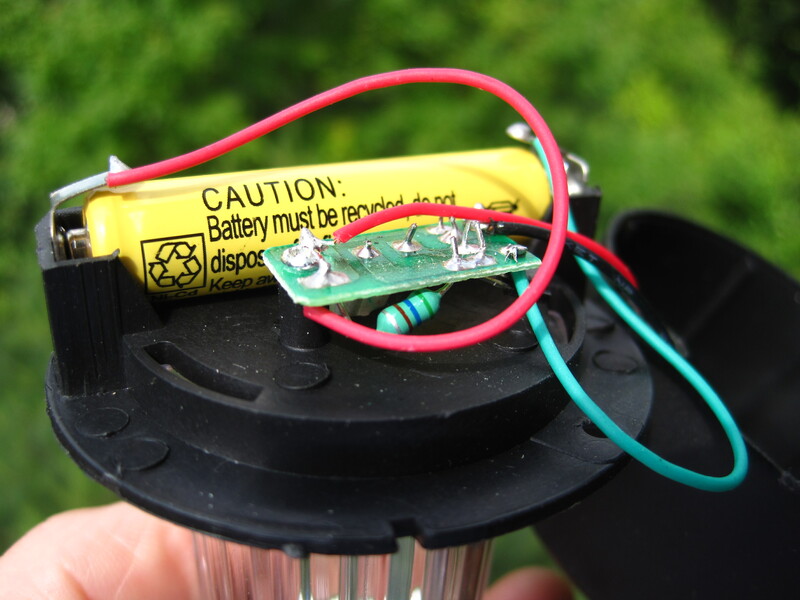 The QX5252F or YX8018 chips typically found in the $1 solar Garden lights are 2-Volt devices and aren’t suitable for a 2.7V Li-ion battery. However, a garden light equipped with a YX8181, YX8182 or YX8182B would work as those chips are specifically designed for 3.7V Li-ion battery use. You’ll have to do your own research on finding a lamp with one of these chips as I haven’t encountered one. However, I suspect that they would be in one of the more expensive, multi-bulb or brighter bulb specialty lamps. Good Luck. Hi. I’m new to electronics and I’m about to try my first circuit on a breadboard. 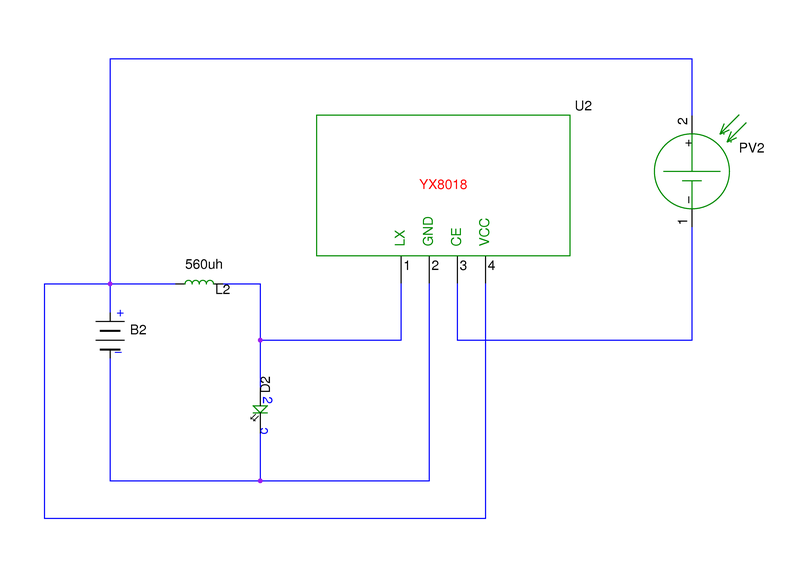 I have some old solar garden lights that I was going to strip out the components to recreate this circuit (I purchased some new solar cells because the ones on mine are shot). This page is great for explaining what’s going on. Added to this your page is the first one I have come across that explains the green component is an inductor and not a resistor. Every circuit diagram I have come across for these lights shows an inductor. I couldn’t figure out why mine had a resistor but no inductor. A resistor made sense because these LEDs usually need one. The missing inductor baffled me. Now I know it’s not missing. Haha. So thanks for this!! 1. Given LEDs normally need a resistor associated with them and these lights don’t have one does that mean the IC is managing this? Maybe through Pin1? 2. Mine has a blocking diode on it which I expected. Yours doesn’t. Is there something else on here that I’m missing that is preventing current going in the wrong direction? 3. Mine also has a non-polarized capacitor (the type with the small brown round/flat head and yours doesn’t. Do you know what this capacitor might be doing? Thanks again for writing this post!! The Garden Light’s LED is white, which operates at about 3.3V. The IC in the Garden light boosts the 1.2VDC battery voltage to a nominal 3VDC which is also pulsed at a 5us rate. This is done to reduce the average current and thus prolong battery life. Consequentially, the voltage powering is more like 3VAC. REPLY: A small value disc ceramic capacitor, like you describe, would probably be there to reduce high frequency noise that could, for example, interfere with nearby radios.